Unfortunately, HTC didn’t announce US availability of the their new flagship One M9, this morning, like we were hoping. But, they did announce a new protection plan that comes with the device for free and will likely come in handy during your time of ownership. It’s call HTC Uh Oh Protection. What is HTC Uh Oh Protection? It’s similar to the cracked screen deal from HTC Advantage that came with the One M8, except along with the one-time screen replacement that Advantage offers, Uh Oh Protection also protects against water damage or if you decide to switch carriers. Plus, if you don’t need use the Protection within the first 12 months of ownership, HTC will give you $100 to spend towards a future HTC One. In other words, if you drop your phone and crack the display or it ends up in a bucket of water and no longer works, HTC will replace it for free within the first 12 months of ownership. The kicker here is if you switch carriers. While HTC hasn’t provided any details yet, it sounds like if you were to switch from Verizon to AT&T, that HTC will swap out your Verizon One M9 for the AT&T variant. That’s pretty cool. According to HTC, in order to initiate an Uh Oh Protection swap, all you need to do is call 1-(866) 449-8358, provide some info about your phone, and allow a $299 hold to placed on a credit card until HTC receives the damaged phone (or send your damaged phone back first). HTC will then overnight you a replacement phone. To learn more about HTC Uh Oh Protection, HTC will be holding a Q&A session at 9AM Pacific (12PM Eastern) that can be seen here. You can visit the Uh Oh Protection site here. Innovative program covers cracked screen or water damage for 12 months, or provides $100 off the next HTC One. Bellevue, WA —March 18, 2015 — Because bad things happen to good smartphones, HTC America Inc. unveils UH OH Protection, a new industry-leading initiative that protects U.S. customers who purchase the new HTC One M9 against life’s uh-oh moments. UH OH Protection includes one free replacement within the first 12 months for a cracked screen, water damage or if you decide to switch carriers. 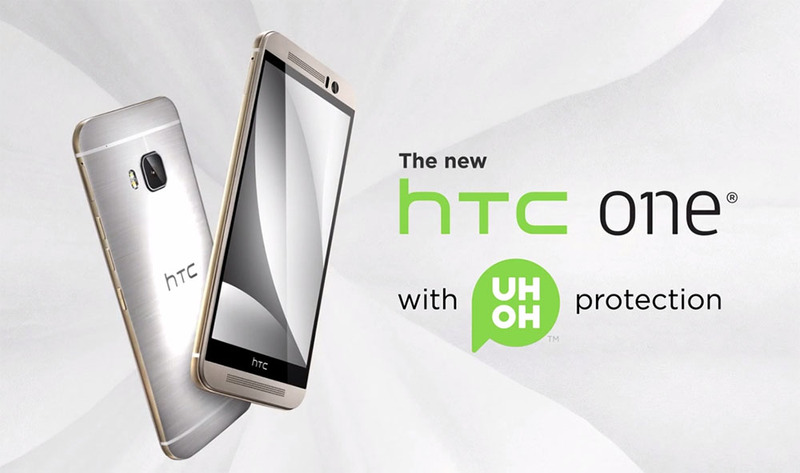 UH OH Protection is automatically provided with HTC One M9, which will be going on sale soon. With a call to HTC Care at 1 (866) 449-8358, an HTC Care team member will arrange to overnight a replacement phone. It is a simple and hassle-free process. For more information, visit www.htc.com/us/uh-oh-protection. Question of the Day: Why Aren't You Buying the HTC One M9? Why are You?